Use the built-in checklists to stay on top of your monthly to-dos. Each checklist is completely editable so you can input your own tasks. Plus, we've added our strategic insight to help you along with planning! That's right! This planner is built right within Google Drive's Spreadsheet Application so you can take it with you on the go via mobile! Google Drive also ensures all of your changes are saved so none of your planning is deleted. This calendar includes the most important national observances each month in daily, weekly and monthly formats! 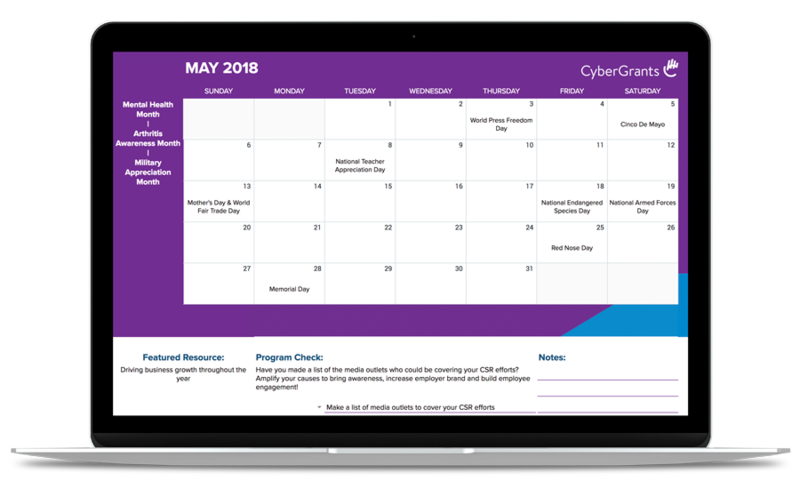 Make planning a breeze with our comprehensive calendar. We've also included monthly resources! CyberGrants is proud to work with a roster of bluechip clients that spans all major segments of the global economy, including over 50% of the Fortune 100. National observations, featured resources, monthly checklists and a section for notes makes this planner a must-have for 2018!